A call to Moran Yacht & Ship confirms that Brian Moran and Oxana Fesik acted for the buyer in the recent sale of the 43.89m motor yacht Mirgab V, with Julian Calder and Stuart Larsen at Fraser Yachts representing the seller. Mirgab V was delivered by Burger Boat Company in 2006 to ABS class and is MCA compliant. 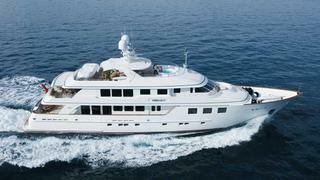 She can accommodate 14 guests in a full beam master, four doubles and two twins. This superyacht has a range of 3,800 nautical miles at 10 knots and was on the market asking $21.995 million.